Easter comes but once a year, and what could be a more festive and personalized way to celebrate with your family than making a hand painted Easter Egg Tree? An Easter Tradition borrowed from the Germans, this fun, inexpensive family project will make a welcome addition to your Easter Decor. Begin by preparing the eggs for decoration. To do this, you will need eggs, a large needle and a bowl. Carefully pierce each end of the egg with the needle. Use the needle to make the hole at the smaller part of the egg a little larger. Press the needle far into the egg’s cavity in order to break the yolk inside. Now that you have made the holes, place the egg over the bowl and have the large hole towards the bowl. Gently blow through the other hole you created, allowing the egg’s contents to go into the bowl. Once all the white and yolk have been removed, gently rinse the emptied shell with cold water. Allow the eggs to dry completely before you begin to decorate. Once the eggs are dry, let the fun begin! From here, you can embellish the eggs any way you wish. You can dye the eggs with food coloring (3/4 cup water, 1 teaspoon of vinegar and ¼ teaspoon of food coloring), use acrylic paint, glitter and glue, the possibilities are endless! You can use spray varnish or clear nail polish to protect your creations. Why not let each member of your family personalize their own egg so you will have a “family” collection – a nice memento to keep for years. Now that you have your decorated jewels ready to display, get them ready for hanging on a tree or another suitable plant. Select thin ribbon in a color that complements your decor. Make a large knot or bow at the end of a 12 inch piece of ribbon. Using a large upholstery needly, carefully thread the ribbon through the egg. The egg will rest on the bow. Hang you eggs on a topiary or small indoor houseplant. Or, you can make your own centerpiece using branches anchored to floral foam inside of a flowerpot. 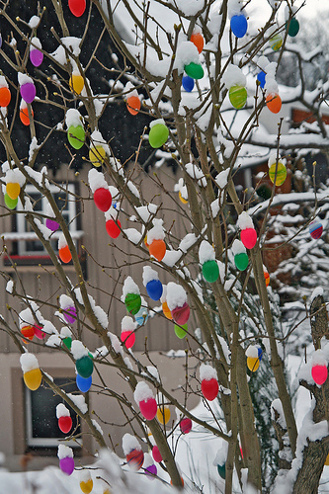 If you have a tree or a twiggy bush in your garden, you can hang some of your decorated eggs outdoors to give an easter feel to the exterior of your home too. If you take care of the eggs after easter is over, they should last you for years to come!